I am normally, totally, completely, a die-hard fall fan. Like can’t.wait.for. college football, chili and soup, pumpkin, Halloween, Thanksgiving, boot wearin’, cooler weather, fall. But this year I can’t seem to get on board. I want summer to last. I want need more lazy days by the pool, I need more time to tackle my summer reading list (I’ve been reading the same one book all summer), I need the long summer days and sunlight, I like my cute summer outfits, consisting of shorts and tank tops, my body craves the fresh summer fruit, like no body’s business, and I haven’t had nearly enough summer barbeques with my friends and family. Yeah, sure it is hot, but we have actually had a rather ‘mild’ summer this year, with only a handful of triple digit days compared to, like 100-something last year. I think it all stems from the fact that I was super busy at the beginning of summer and really didn’t get to start *enjoying* summer until just a few weeks ago. And I guess that is my underlying fear for fall. I was looking at my calendar a few days ago and realized that from the first week of October, until practically the middle of January I have something almost every weekend not to mention a busy weekday schedule. I just don’t want fall (not to mention Christmas) come and go in a blink of an eye and miss out on things like playing in the leaves, ‘pumpkin hunting,’ our annual horror movie marathon, or just simply a brisk fall walk. But until I am *forced* to recognize fall, I will still embrace summer as long as I can. That means eat more burgers. 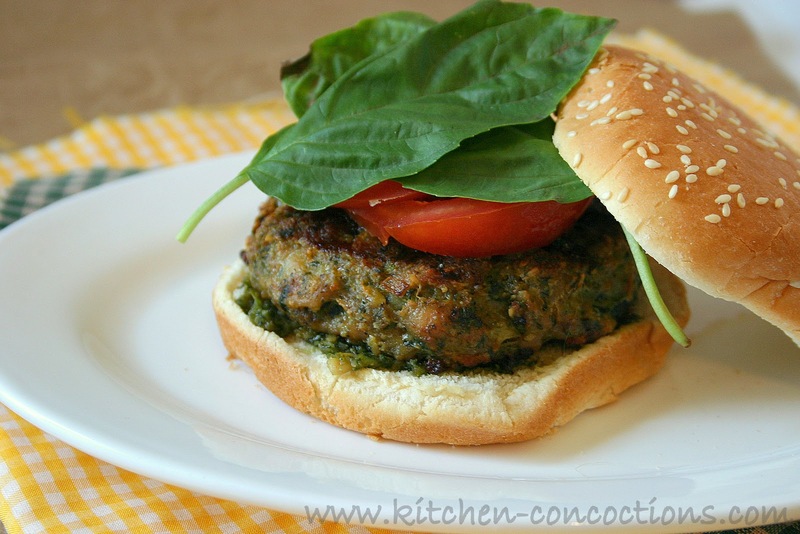 Well, we actually eat burgers year round, but these burgers, with homemade pesto and basil leaves, are simply summer. They have been our favorite burger as of late. I have made these with both ground chicken and ground chicken sausage, and love the added depth of flavor the sausage adds. But, if all you can find is regular ground chicken that works fine too. These burgers are complex, yet simple and incredibly flavorful, moist and juicy. So before summer officially ends, gather up that last little bit of basil (if your plants are still producing, if not buy some from the store, or check out this article for other leafy greens you can use) and make these burgers, perfect for Labor Day. Preheat outdoor grill or indoor grill pan to medium high heat. Combine the first nine burger ingredients in a large bowl, and mix thoroughly together. Form burger mixture into four patties. Place prepared burgers on grill and cook 4-5 minutes per side, or until cooked through. Spread additional pesto, as needed, on hamburger buns. 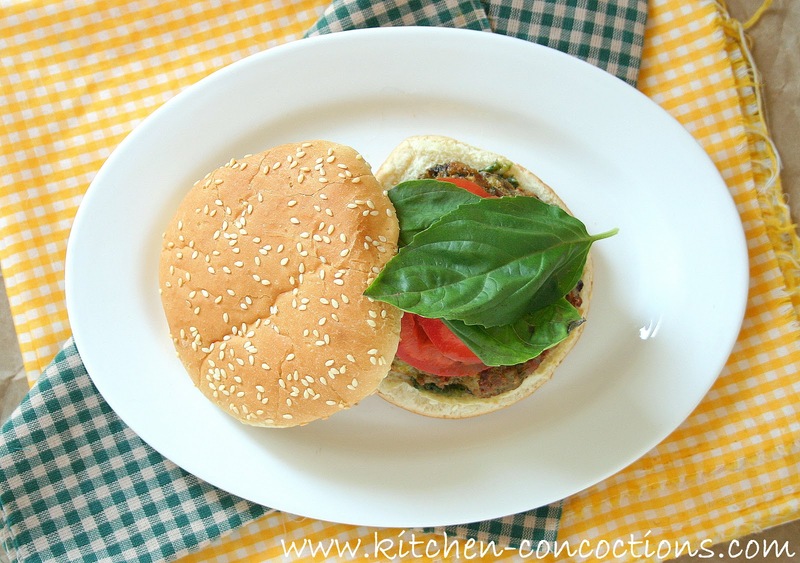 Top pesto covered buns with cooked burger, basil leaves, and tomato. 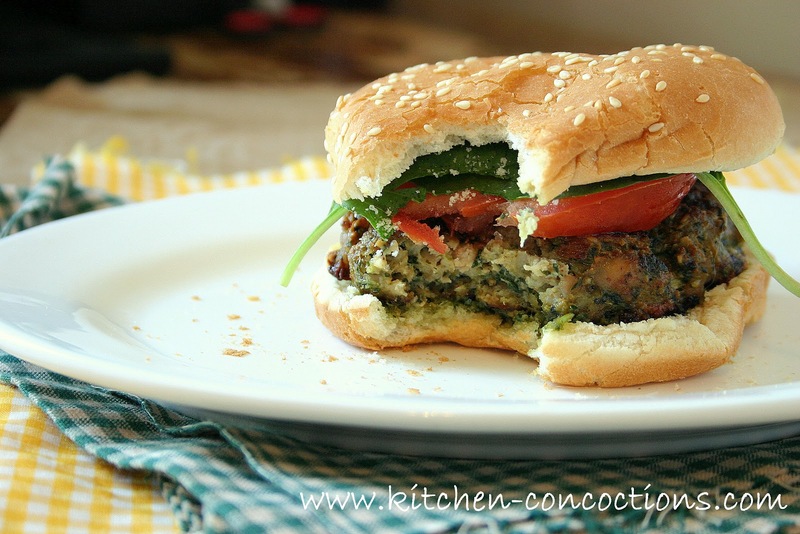 Linked over from Picky Palate and noticed your post about hatch chile rellenos – LOVE this pesto chicken burger recipe AND the hatch recipe! Instant bookmark for you! Also – I'm a Texas gal myself. Keep up the good work!